Happy Halloween!!!! We have had such a good fun for the build up to today. 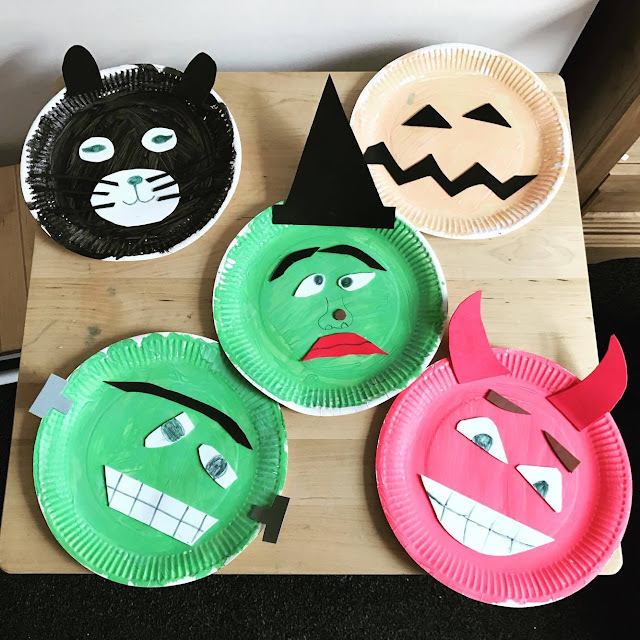 Making spooky potions, monster pictures and then finally making some spooky halloween faces to stick up as decoration. 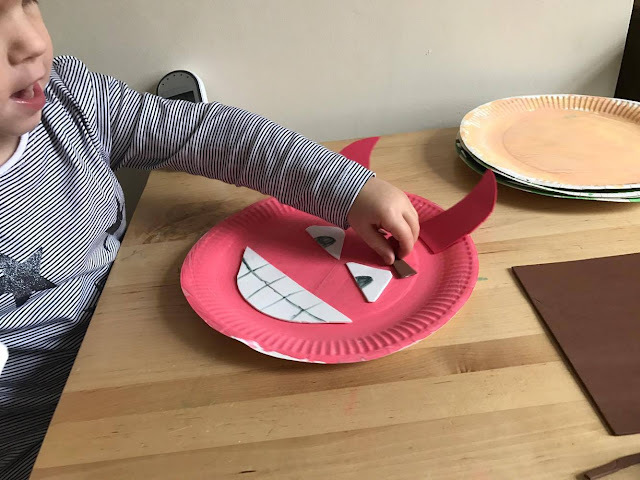 These are so easy to make and Lily really enjoyed making them. The instructions to make these are so simple its going to be mostly pictures you see. But to start you need to get some paper plates, paint, glue, a felt tip and coloured foam. Firs thing you do is choose your characters. You can make all sorts of spooky characters. 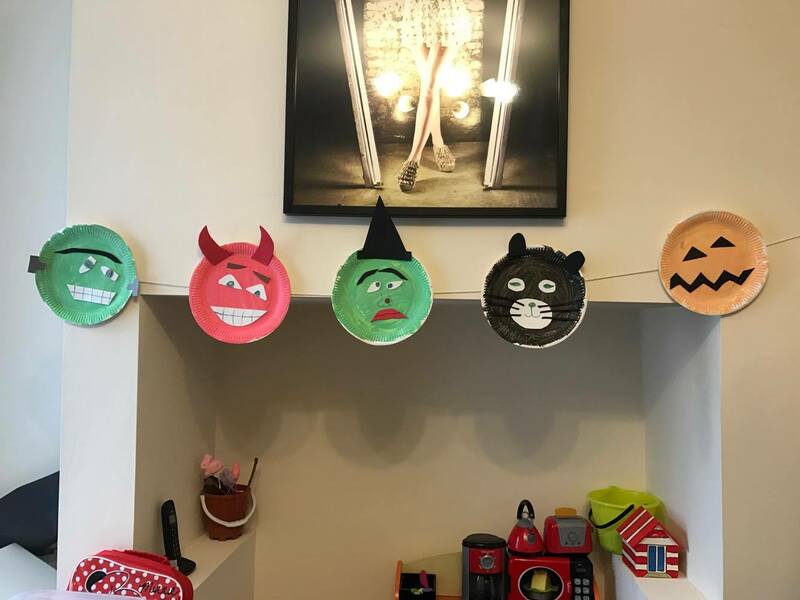 We decided to make frankenstein, a witch, a pumpkin, a devil, and a cat. 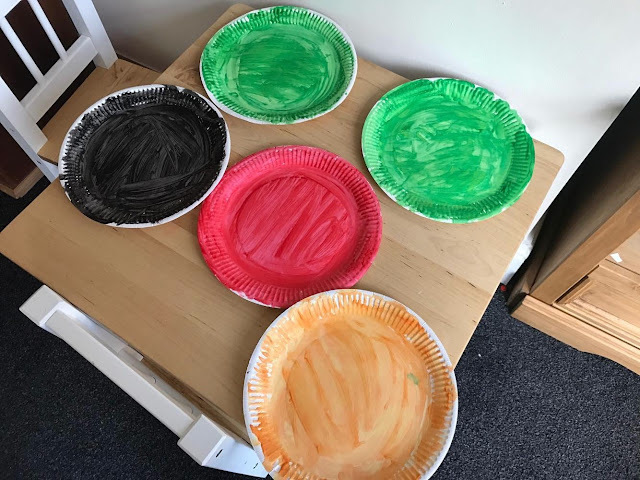 Get your paints ready and then paint the entire paper plate the colours you need. So we did 2 green, one orange, one red and one black. 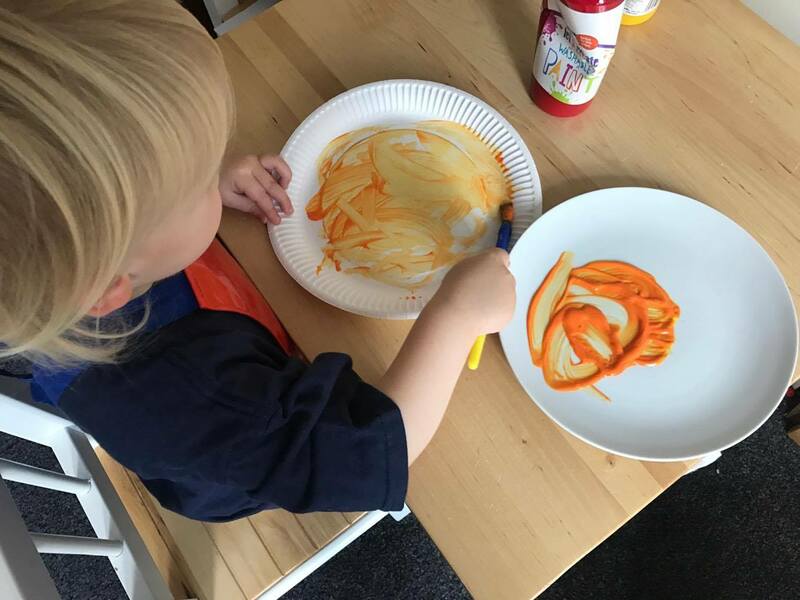 Lily really enjoyed painting these. I also quizzed her on somethings, like asking her "what colour are pumpkins" which she replied orange. 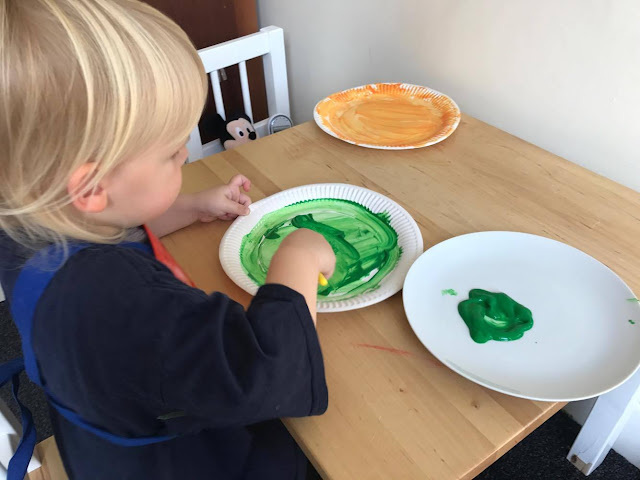 After they are all painted, you will need to leave them to dry before doing the second stage. When they are dry, its time to decorate. You can be as creative as you want with what you stick onto the faces. You could do smiles, frowns, fangs, big eye brows, small eye brows and so on. 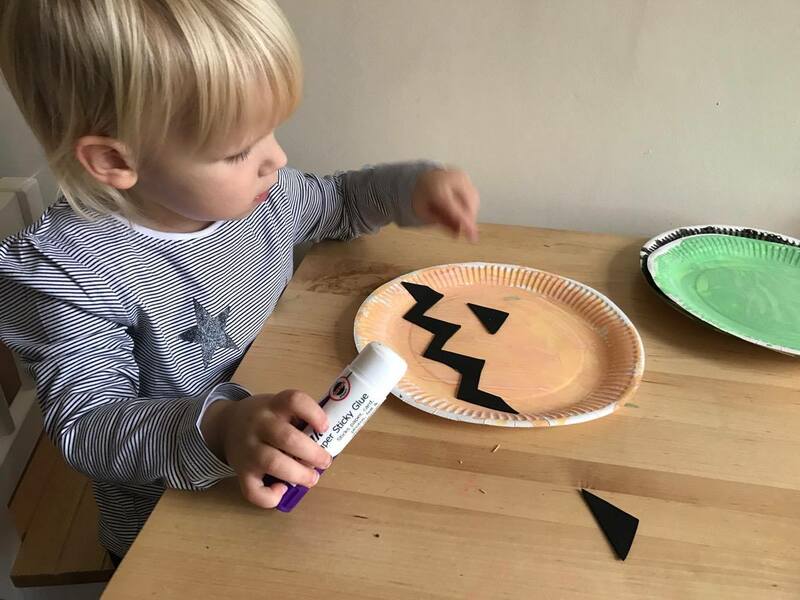 For this part, I did the cutting and Lily did the sticking but if your child is a little older they will be able to cut the shapes for themselves. You may also want to draw on the foam to give the shapes more details, like teeth. Lily is quite good at knowing where to stick the eyes and mouth but needed a little direction for a few things, such as the witches spot on her nose (that I drew) and the bolts for Frankenstein. Lily did most the sticking on the faces but got a little bored to the end and I finished off the cat. After they were all stuck down, they made such great faces. 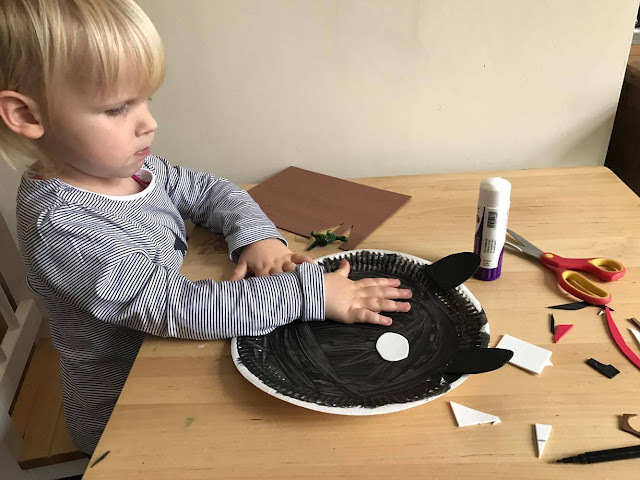 We had so much fun making these and they were so quick to make with little resources needed. After you have finished the faces, you could do what we did and attach them to string so they can be hung up on the wall. I used tape but a few days later and they have all fallen down. So you may need to re think that one as they may need something stronger. Which of the faces do you like? What face would you make? Happy Halloween. I love these spooky faces, great fun! Brilliant work! I love the cat and the pumpkin, though I'm sure I'd make a terrible mess with all that black paint, myself :D.
Impressed! I hate doing painting at ho,ev with the kids! They look really good! I love seeing children make crafts! Like the cat, which is the one I'd like to make. Paper plates might be a good way of making face mask, children do love craft making.